One of the things I love most about our “Beautiful Homes of Instagram” series is the fact that I can share any type of interior style. 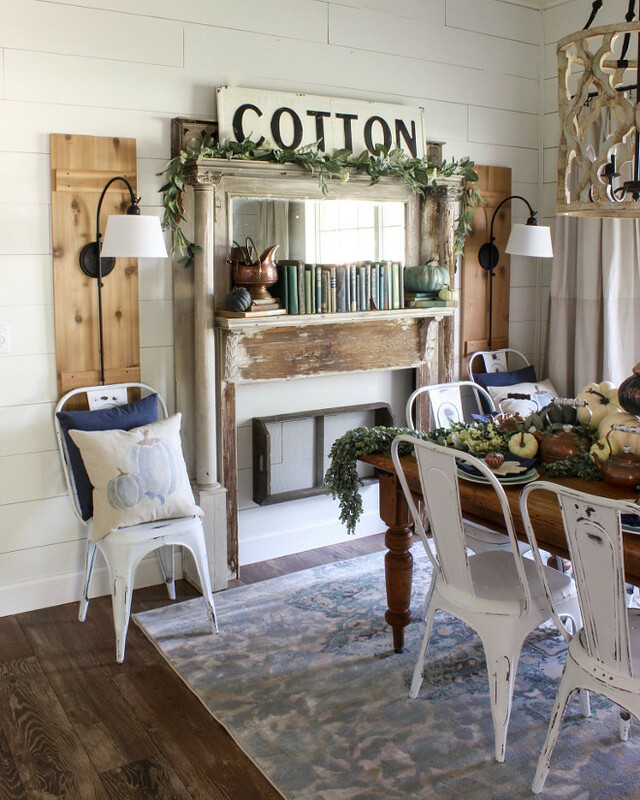 Farmhouse, traditional, coastal… anything that inspires us and most of all, anything that can teach us something new and if you love DIY projects, you find yourself in the right place today. 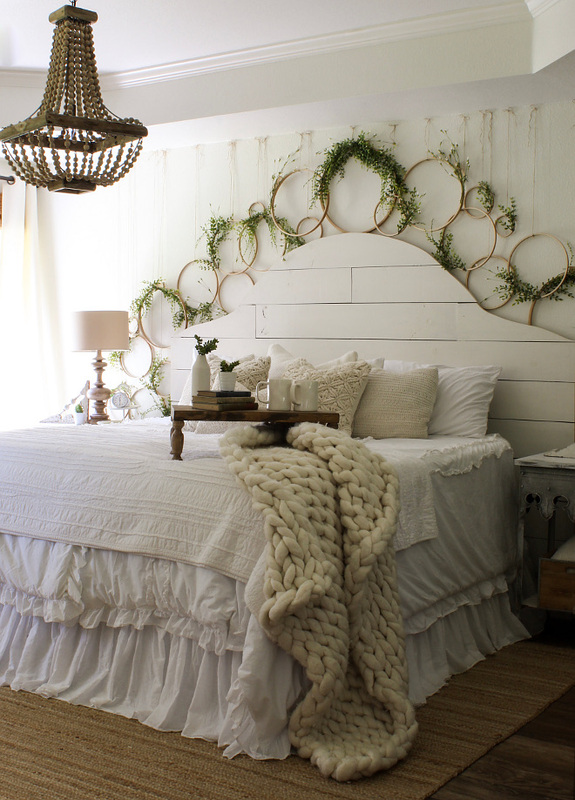 Erin, from @cottonstem, is the queen of DIYs on Instagram. 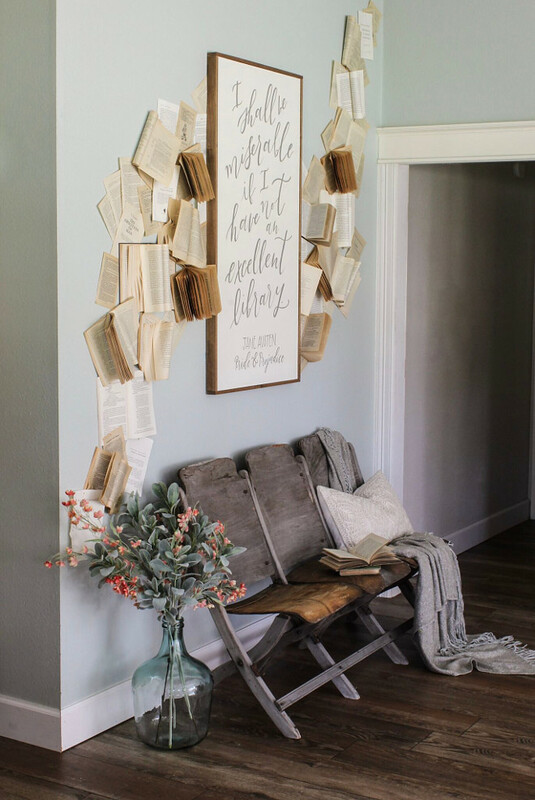 I have been following her for quite some time and I always feel amazed by the DIY ideas she shares, and I know that you will be amazed as much as I am. Read on! 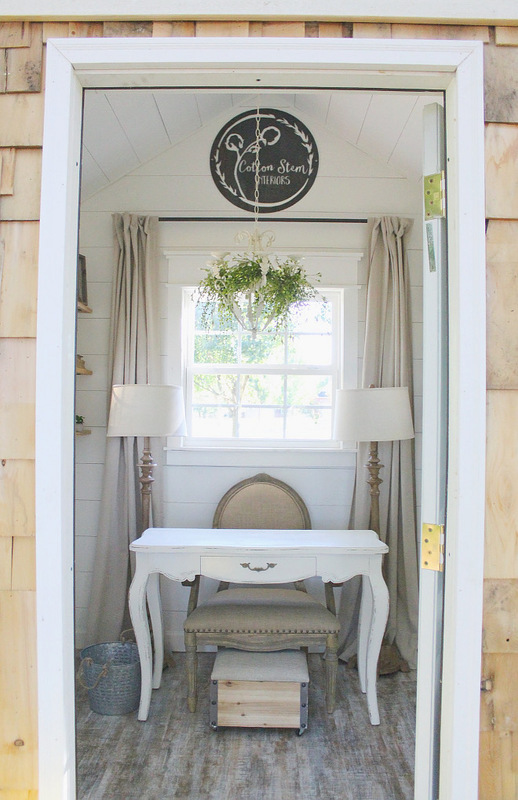 Imagine, if you will, the geekiest of freak out moments, hands flapping, giddy squeals abounding, and that is what I looked like when sweet Luciane asked to feature our home on HomeBunch! So many gorgeous homes from some pretty darn talented people, and I’m kiiiiinda pinching myself that Luciane even knows who the heck I am. Ha! Before she figures out that I’m a total cray, let’s get on with the home tour, shall we? 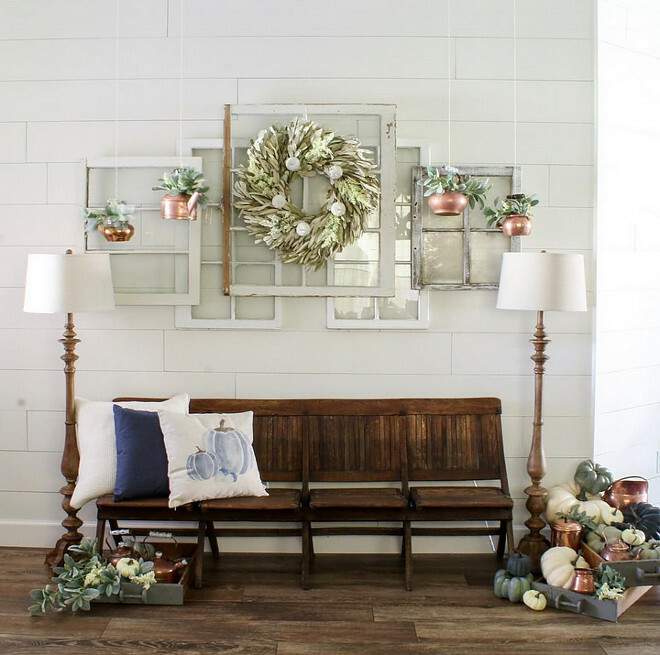 My name is Erin, and I’m the gal behind @cottonstem, an interior décor and e-design company specializing in affordable and approachable DIY-friendly design. Now…if you’d asked me ten years ago if the above sentence would ever be connected with my name, I would have laughed! I’m actually a former high school English teacher, and, on the side, I found myself decorating for family, friends, friends of friends, until things snowballed and I began to pursue this biz full-time. I love to be creative, to dream up crazy new ideas, to help others realize their own design dreams, and, best of all, I get to do this job right alongside the other job of my dreams: mommin’ my four little daughters. My husband and I met in college and finally began dating after I bought a date with him at a fundraiser, and we’ve been married for 12 years now. He’s so patient and supportive, carving out time and space for me to chase my dreams…plus he indulges all of my DIY ideas and crazy out-of-the-box concepts, and he’s usually the one holding the hammer and hoisting the furniture all around. What a guy. 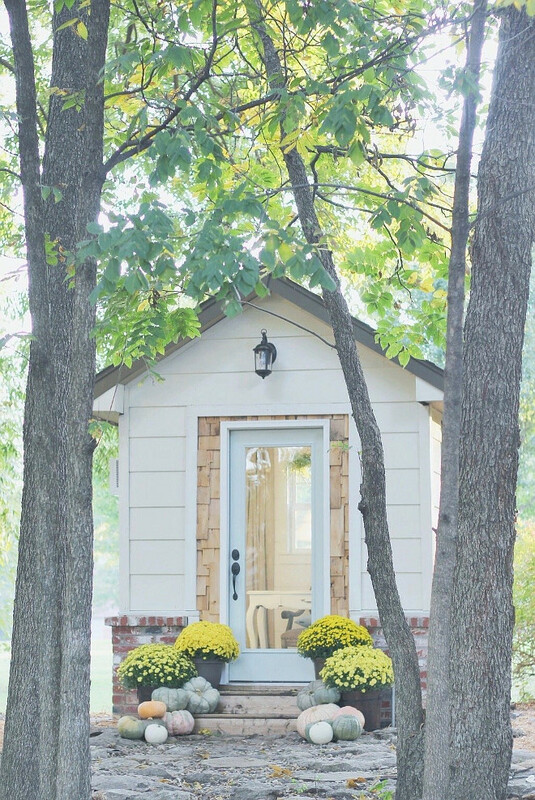 We are located near Tulsa, Oklahoma in a neighborhood built around 2000 with homes nestled high on a wooded hill, placed carefully between mature oak and pecan trees that the builders thankfully worked around during the building process. Our home sits on a little over an acre of heavily treed land, and it’s truly a wonderland for our little ladies. 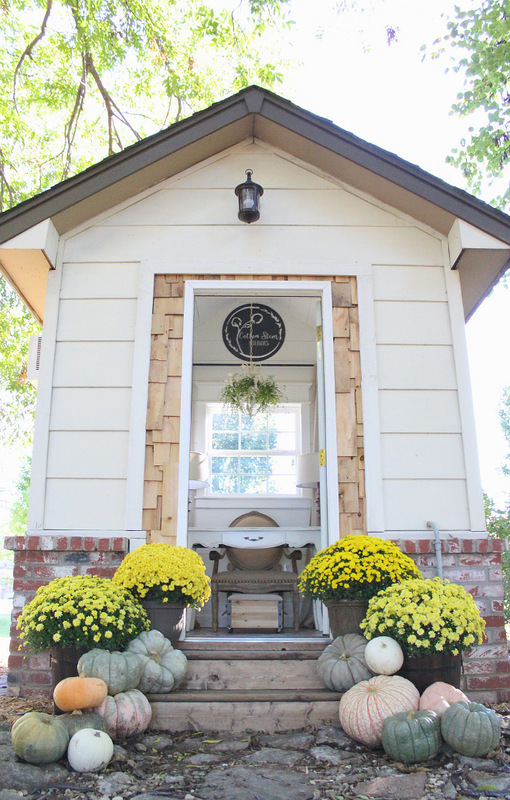 Further back in our side yard sits my little 80 square foot she shed, the headquarters of Cotton Stem Interiors. That tiny space is my happy place, and it’s where I go to create, to write, to plan and to dream! Over the past six years as my interiors business began to take shape, I found my personal style gravitating around crisp whites, soft fabrics, washed woods and pops of green. 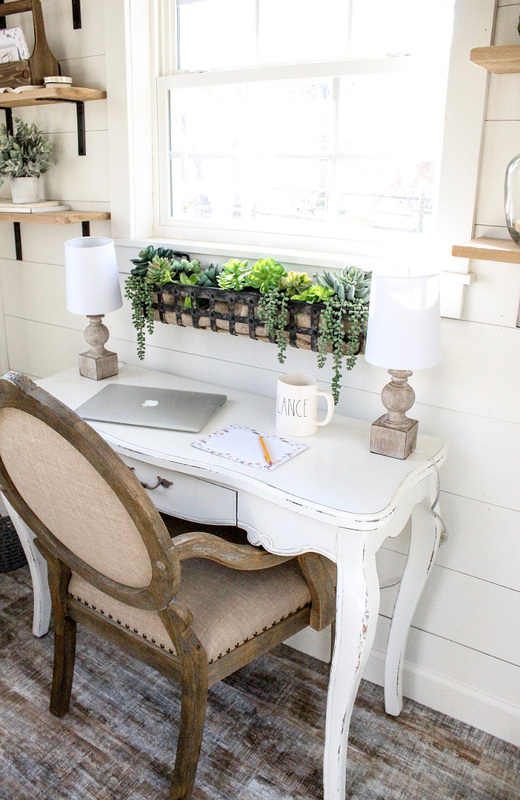 My style is a little bit farmhouse, a little bit cozy French cottage, and a whole lot of approachable DIY! Decorating on a budget for years, I’ve learned many ways to accomplish design dreams on a dime, and I’m living my own personal dream by daily helping others achieve theirs. 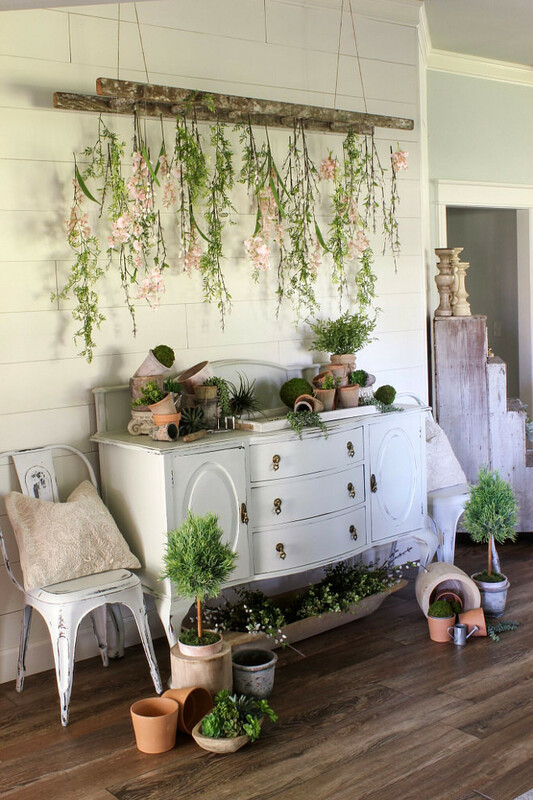 Entryway with hanging flowers – what a beautiful idea! 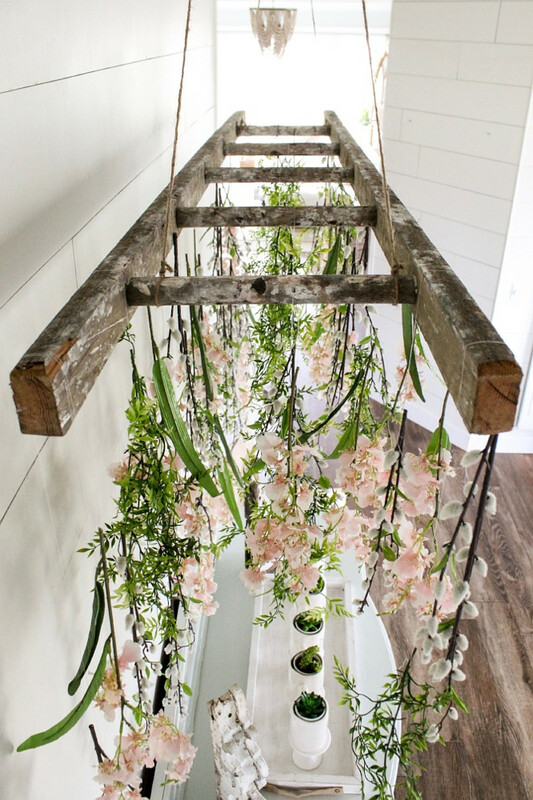 Décor: DIY hanging faux flowers using vintage ladder and threat. 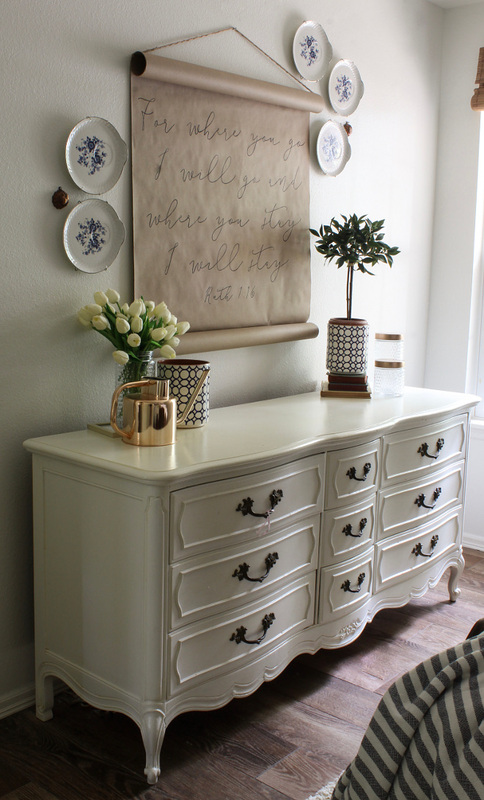 Paint Color: Sherwin Williams Alabaster on DIY shiplap walls / Sherwin Williams Sea Salt on ceiling and vintage buffet. DIY tutorial can be found on Erin’s blog. 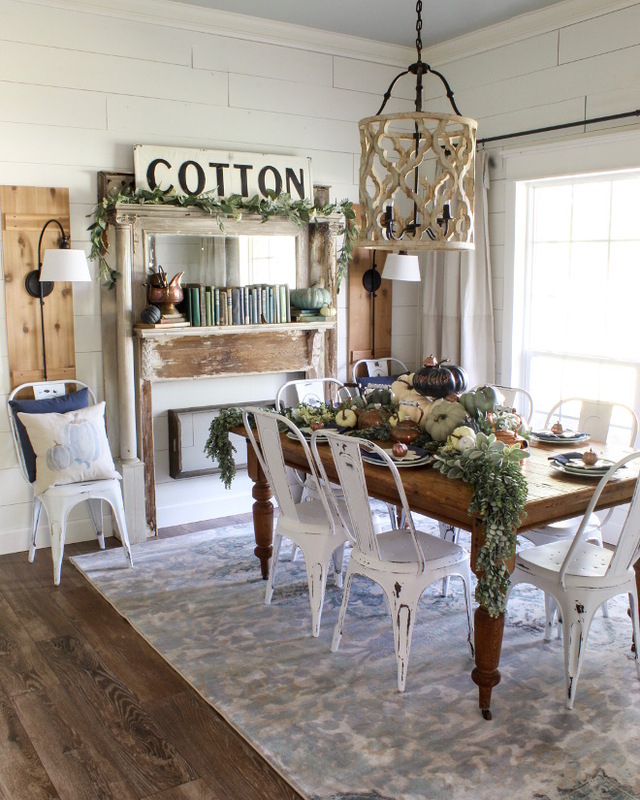 Erin’s dining room is ready for Fall and I am loving the decor! Area rug: Rug is the Ciato Blue Vintage from Well Woven. Faux pumpkins were handlettered in copper. Chairs: Flash Furniture Distressed White Metal Chairs. Vintage 1900’s fireplace that survived a farm fire locally, and we were able to restore it and give it new life! -Vintage farm table dating back 150 years, and we purchased it from the original owner’s grandchildren. The original owners’ initials are carved into the table. 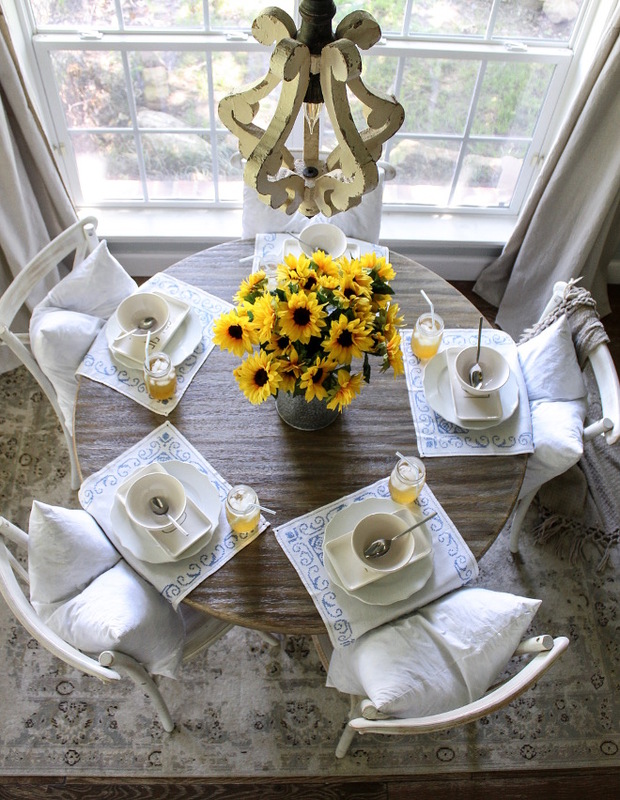 -Faux lemons and a primitive dough bowl shipped from the Ukraine created an easy summer centerpiece. 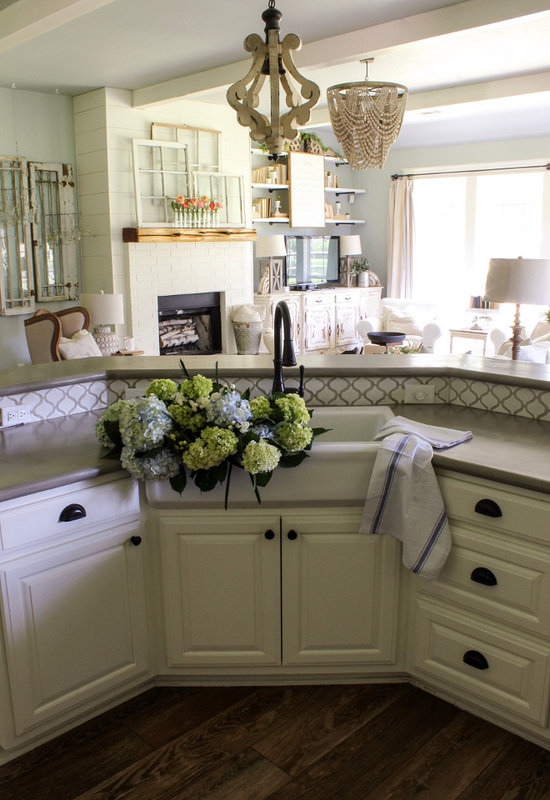 This kitchen features so many great diys, from the shiplap island to the countertops! Barstools: Hampden Industrial wood top barstool. Countertops are are DIY concrete over Corian. Grout: Grey Oyster grout from Home Depot. Here Erin shows her collection of hard-to-find Rae Dunn dishware that she has collected over time, along with her collection of vintage LuRay dishes in soft blue/green. Round pedestal table: The Blanca Table. Chairs: Collin Distressed White Dining chairs. 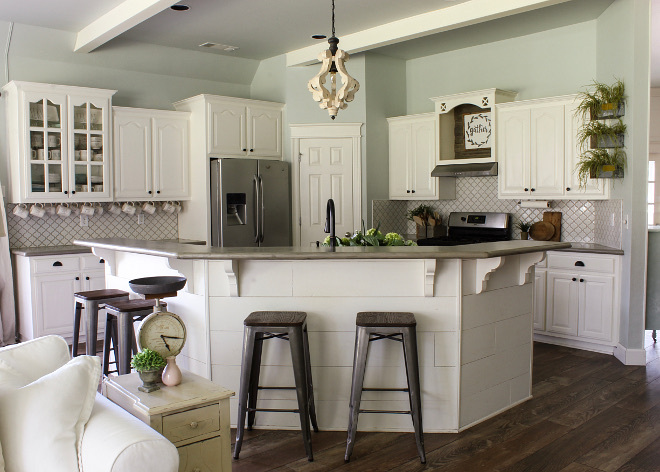 Fixture: Antiqued White French Country pendant. The kitchen and breakfast room opens to an inviting living room. Seating: IKEA Ektorp sectional and chairs in white slipcovers. Rugs are from Rugs USA. Light Fixture: Wood bead chandelier from Painted Fox Home. 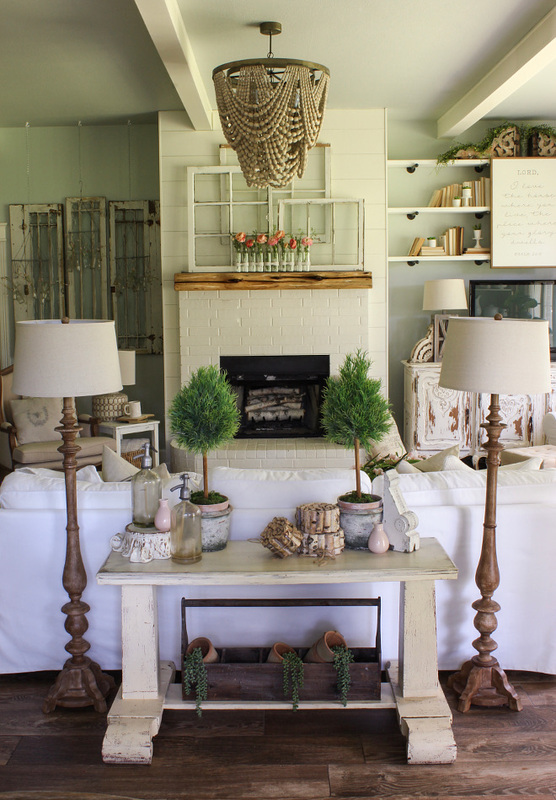 Paint: Shiplap & Fireplace is SW Alabaster and walls are SW Sea Salt. DIY shiplap using pine underlayment cut into 8in strips and painted SW Alabaster. Isn’t this magazine worthy? 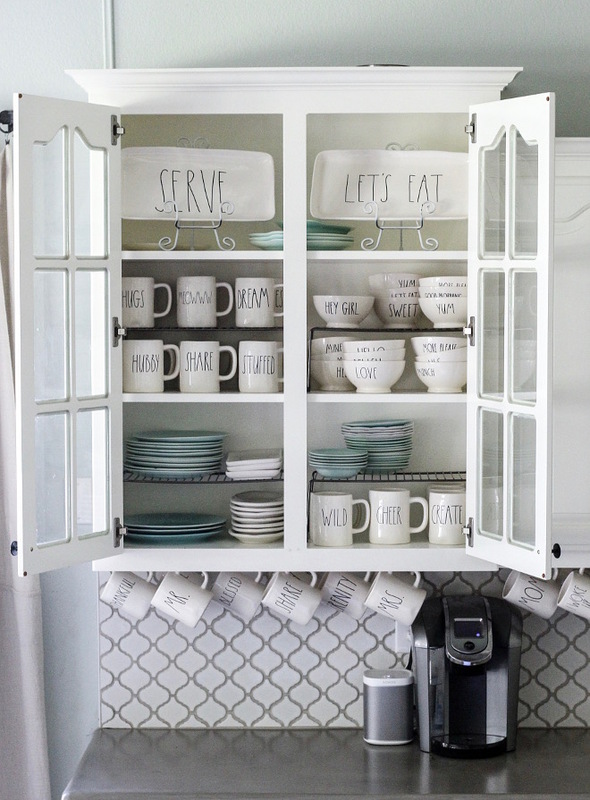 Erin brings so many amazing ideas to her home! 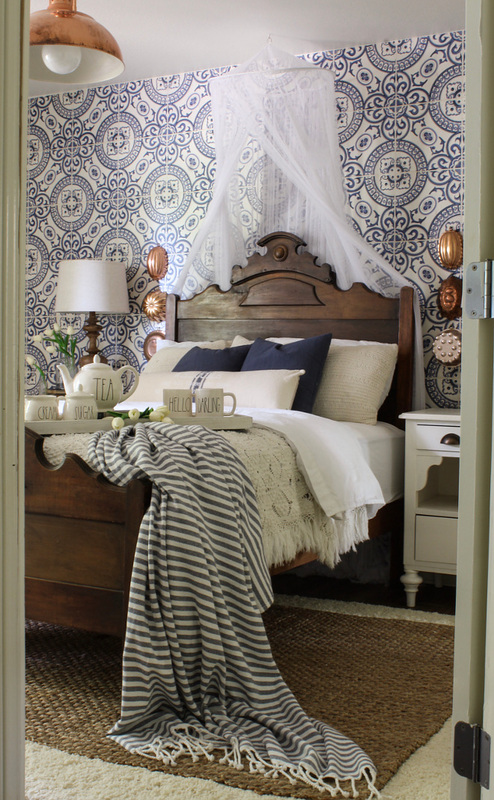 Source: Pumpkin pillow, white pillow, navy pillow, artificial pumpkins, floor lamps. 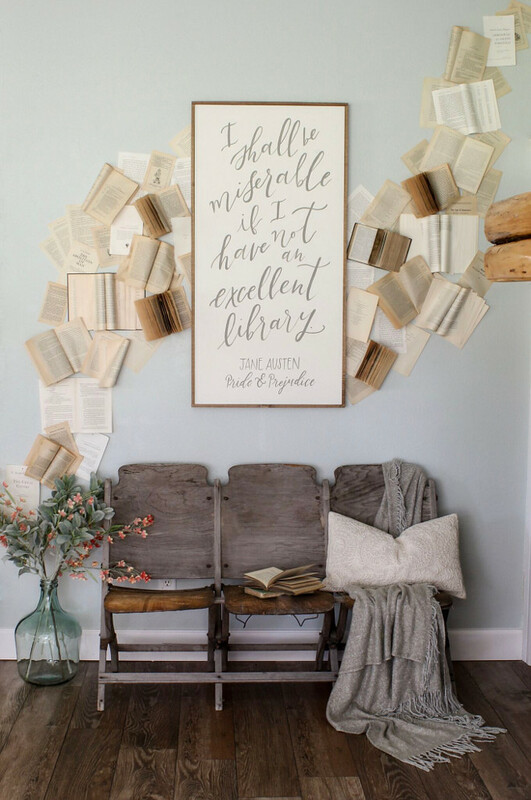 Décor: hand-lettered wood sign from @navybeanlettering and DIY book wall using vintage books. The vintage theater chairs sourced locally. Paint Color: Sherwin Williams Sea Salt. Erin needed a space for her four daughters to stay organized with school and dance. 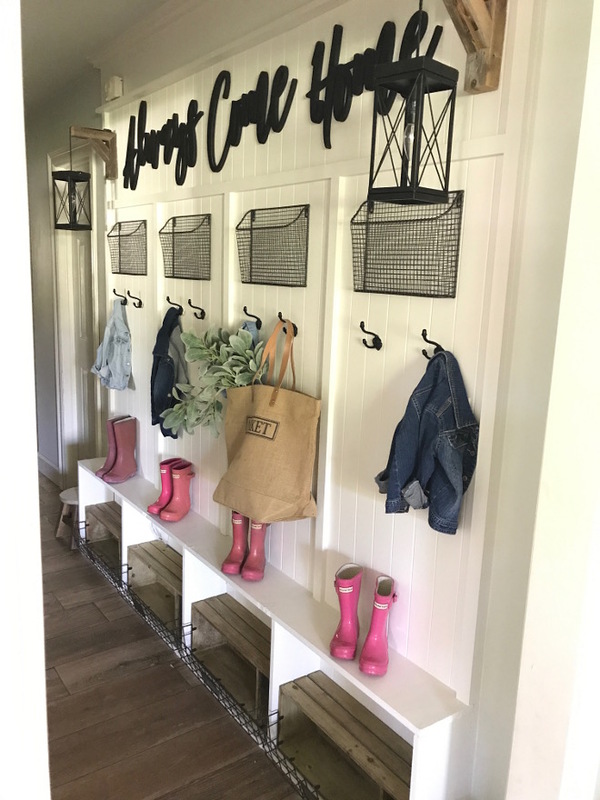 So she did this DIY mudroom/drop zone by using bead board. I love it! The laser cut wood letters are from Harper Grace. 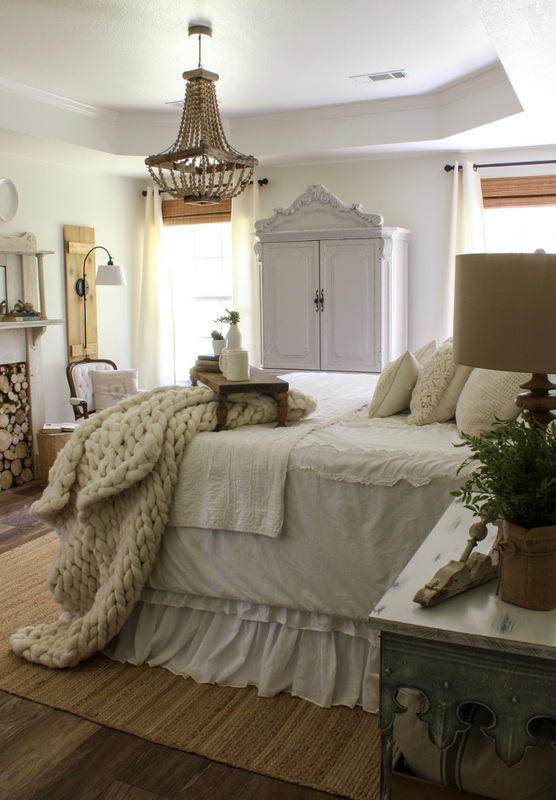 This is one of my favorite bedrooms I have posted in a while. Isn’t it enchanting? The paint color is Sherwin Williams Alabaster. Duvet: Ruffle Duvet from Target. Throw: Chunky Wool Knit Blanket is from Etsy. DIY embroidery hoop wall can be found on Erin’s blog. 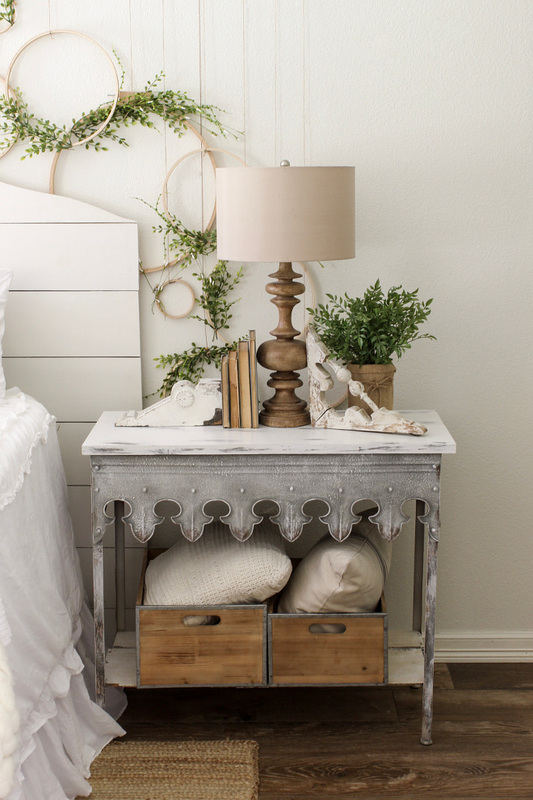 Nightstand: Gable Lane Scalloped Edge Table. Lamps: Turned Column Washed Wood Lamp. Light Fixture: Shady Oaks Farm wood bead chandelier. Fireplace: Early 1900’s vintage mantel with DIY wood slice insert and antique French chairs. The cement tile-looking wallpaper is Milton & King Wallpaper in Heritage Tiles. Stunning! Fixture: vintage 1940’s copper fixture. Bed: vintage 1900’s East Lake bed. Rugs: White cream rug from Well Woven. Bed canopy can be found here. 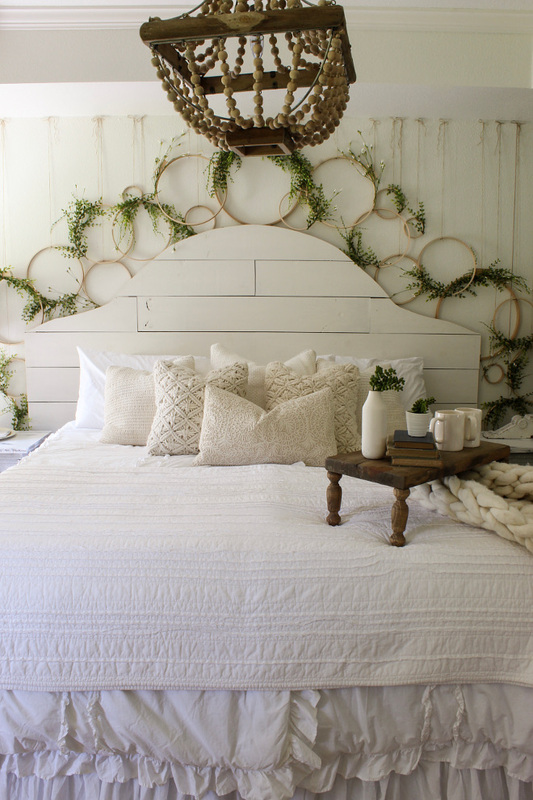 I am loving how Erin decorated this guest bedroom. It’s full of personality and inspiring ideas. 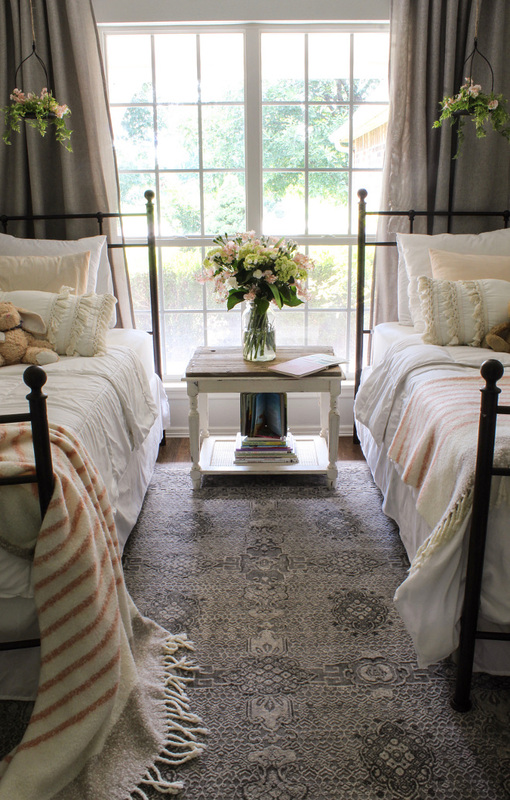 Iron beds: Antique bronze twin bed. 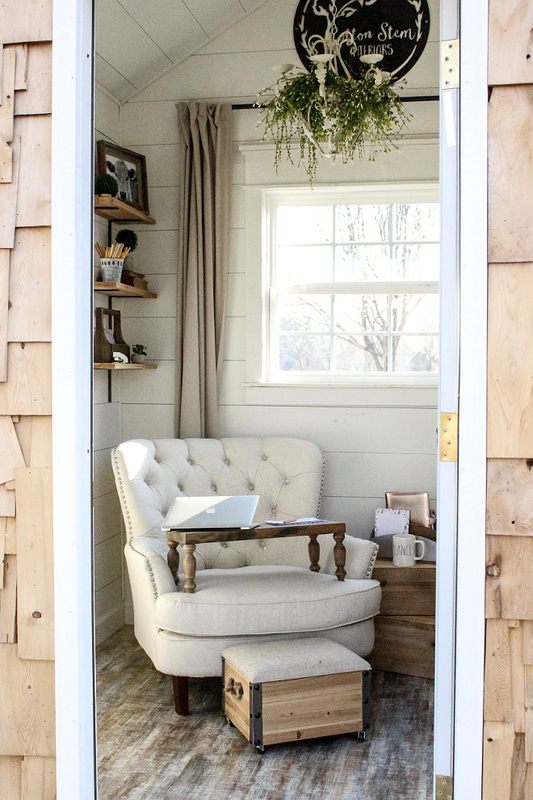 Erin converted an unused utility shed into her home office. 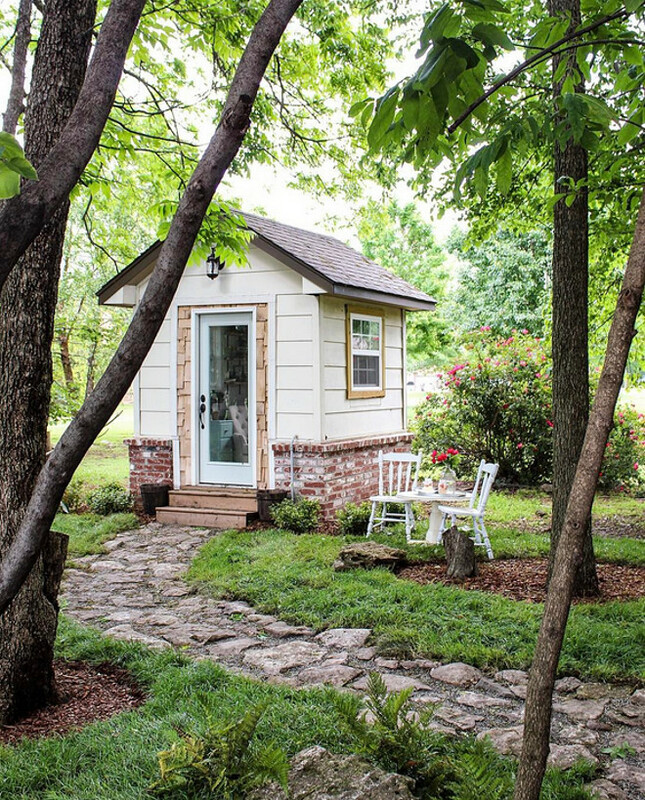 The shed comes complete with heating, air and wifi! She used DIY shiplap with pine underlayment cut into 8inch strips. 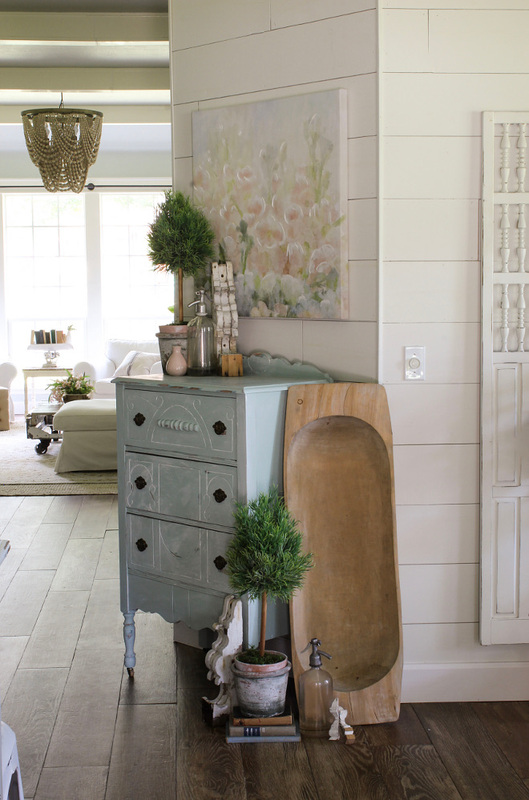 The shiplap paint color is Sherwin Williams Alabaster. Who wouldn’t love to have a place like this? Interiors & Photos: Erin from “Cotton Steam“. 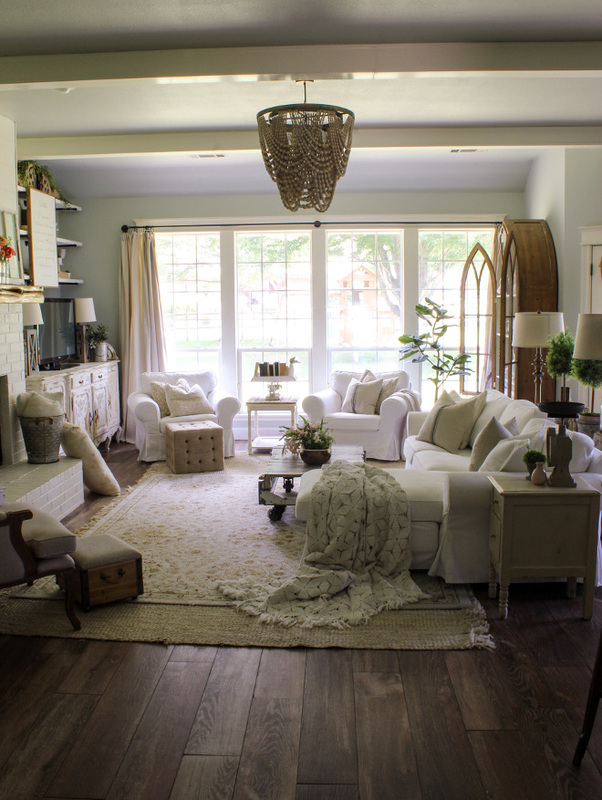 Make sure to follow Erin from @cottonstem on Instagram to see more photos of her beautiful home! 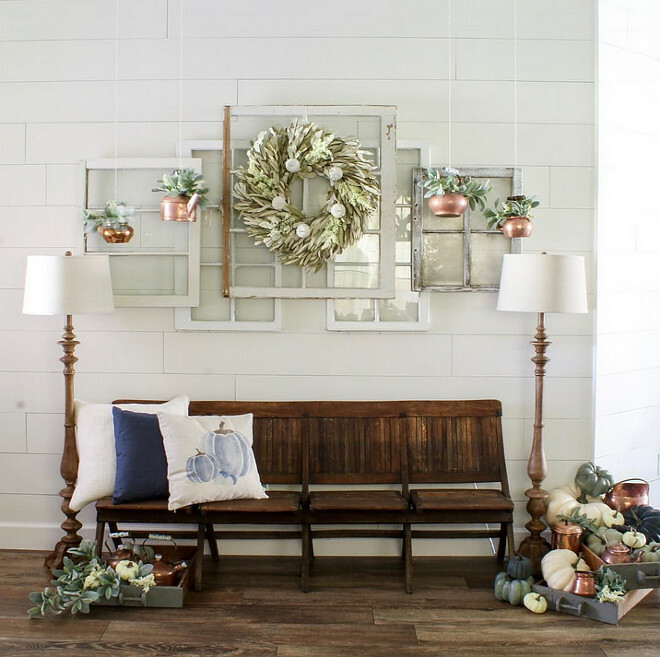 Newest Fall Post: Instagram Fall Decorating Ideas. @sanctuaryhomedecor: Beautiful Homes of Instagram. 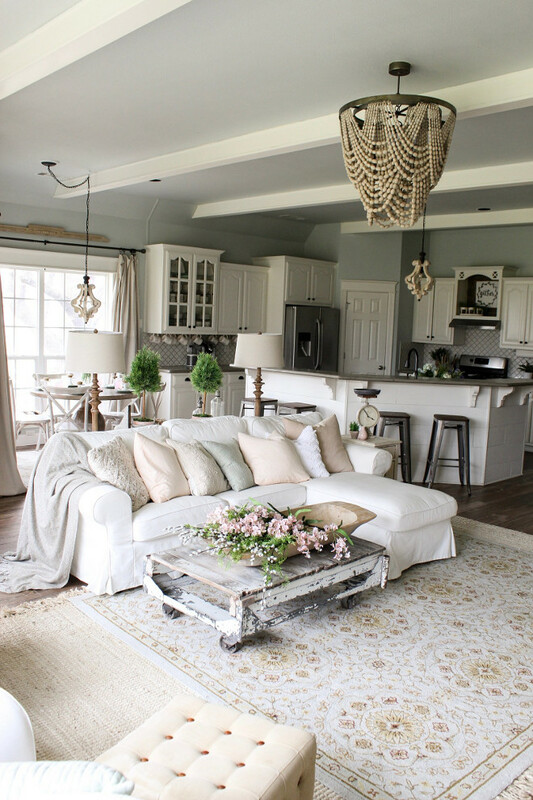 Being one of the most popular posts on Home Bunch, this home went viral on Pinterest! How are you, my beautiful friends? What a sweet home! 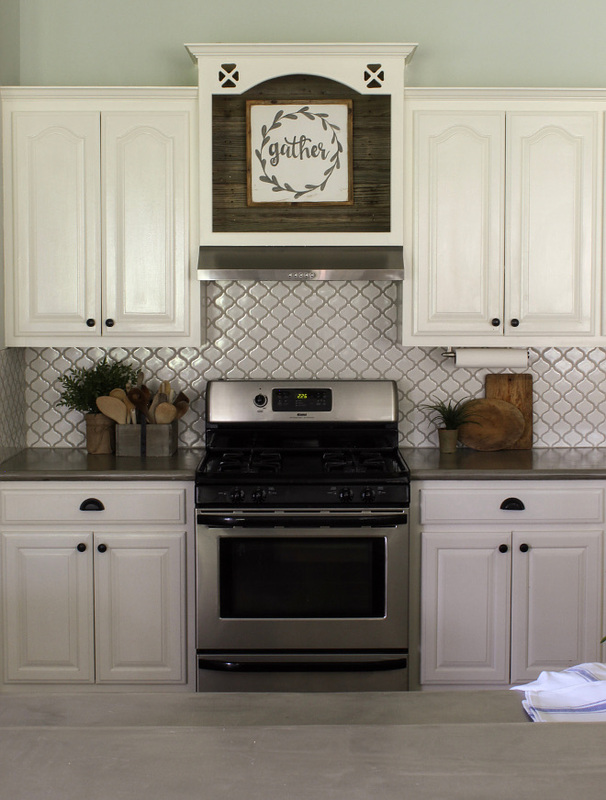 This is a place where you feel Love – where you can see how much the homeowner loves her home and works hard to make every space feel extra special. People like Erin are truly inspiring to me. Have a Blessed week, everyone and try to keep this in mind during this week; ” I will be a voice for good – I will bring good to this world and those that I come in contact with”. The world needs kindness. I love to dance. 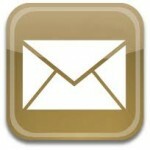 I am a fond researcher in the world wide web searching mainly home design ideas and construction.